Astrocytic ‘uncoupling’ identified and reversed in temporal lobe epilepsy. Epilepsy is a very prevalent neurological disorder. Approximately one-third of patients are resistant to currently available therapies. A team of researchers from the University of Bonn has discovered a new cause to explain the development of temporal lobe epilepsy, at an early stage astrocytes are uncoupled from each other. This results in the extracellular accumulation of potassium ions and neurotransmitters, which cause hyperexcitability of the neurons. The opensource study is published in the journal Brain. The team state that approximately two percent of the population suffers from epilepsy. Despite intense research efforts, the causes of this disease are still largely unclear. Approximately one-third of patients are therapy-resistant. In some frequent forms such as temporal lobe epilepsy, this percentage is even significantly higher. For this reason, scientists are searching for new strategies in epilepsy research to develop new, more efficient therapeutic approaches. In a new approach the current study investigated the functional properties of astrocytes. These are nervous system cells which belong to the glial cells. They were originally considered only to be glue holding the brain together, but in recent years, astrocytes have increasingly turned out to be an important partner to neurons. Previous epilepsy research has been dominated by the assumption that altered properties of neurons cause epilepsy. The new findings have demonstrated that malfunctions of glial cells play a crucial role in the development of epilepsy. Brain tissue removed from patients with temporal lobe epilepsy was observed by the researchers to be completely lacking in astrocytes. In this condition, no functional networks of coupled astrocytes can be formed state the team. This is because astrocytic networks are missing, potassium ions and neurotransmitters, such as glutamate, which are important for signal transmission, can accumulate in this tissue. This leads to hyperexcitability of the affected neurons and ultimately to epileptic seizures. The question the current study asks, is the loss of astrocytic coupling the cause of epilepsy or is this merely a consequence of hyperexcitability? To be able to address this question, the researchers specifically developed a mouse model which recapitulates key characteristics of temporal lobe epilepsy in humans. In this model,the lab were able to demonstrate that during the development of epilepsy, the coupling between the astrocytes is lost very early, and changes in the neurons are observed only later on. The scientists suspect that uncoupling of astrocytes is mediated by neuroinflammation. The causes are likely so-called cytokines which are released in the brain by activated microglial cells or astrocytes. The team state that they were able to demonstrate that uncoupling of astrocytes, at least in the early stage of epilepsy, can be reversed. Decreased tracer coupling and impaired K+ clearance in the latent period after kainate injection. 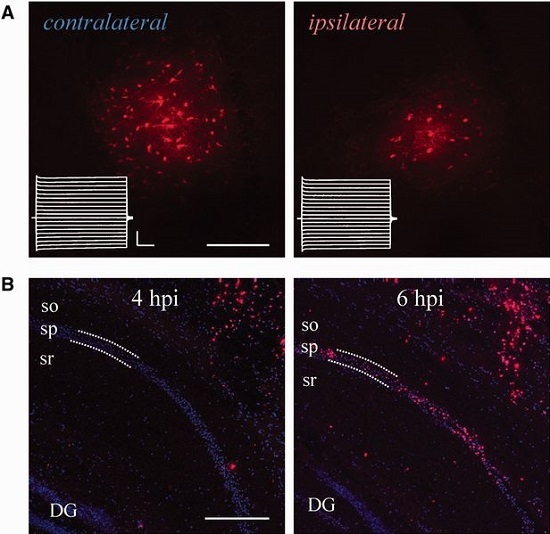 (A) Representative example showing reduced tracer coupling in the ipsilateral hippocampus 4 hpi. Scale bar = 100 µm. Insets show current responses of the filled cells (stimulus protocol as in Fig. 1A; horizontal bar, 10 ms; vertical bar, 2.5 nA). (B) Ipsilateral TUNEL performed 4 and 6 hpi. No TUNEL-positive cells could be detected in the pyramidal layer 4 hpi (n = 7 slices from three animals), whereas abundant staining of pyramidal neurons was found underneath the injection site 6 hpi (n = 7 slices from three animals). sr = stratum radiatum; sp = stratum pyramidale; so = stratum oriens. Scale bar = 250 µm. Astrocyte uncoupling as a cause of human temporal lobe epilepsy. Steinhäuser et al 2015.